Figure S4.1. Regions and transects monitored in BIOTA-AFRICA, ©German Remote Sensing Data Center (DFC), German Aerospace Center (DLR). Scientists have been developing means to structure taxonomic-based databanks of biological samples being collected and / or already deposited in collections like Museums, Herbaria, etc (e.g. Story 1.9). The big challenge is how to ensure that this highly technical information, that often describes new species, is used to improve policy-maker decisions on biodiversity. A good example of an international effort in this area is the Global Biodiversity Information Facility (GBIF, www.gbif.org) that has developed a major campaign, with links to bioGENESIS, to use GBIF data to address the 2010 target of a significant reduction in the rate of loss of biodiversity. At a regional level, BIOTA-AFRICA (www.biota-africa.org) has well explored the possibilities of using similar methods in different countries to generate comparable data (Schmiedel and Jürgens 2005). At a national level, good examples are the Atlas of Living Australia (www.ala.org.au), CONABIO (www.conabio.gob.mx), the INBIO (www.inbio.ac.cr) in Costa Rica, and the work of the South African National Biodiversity Institute (www.sanbi.org), all extremely effective in transforming scientific information into policies. Another important experience, at a sub-national level, is the BIOTA/FAPESP Program (www.biota.org.br), that trains postgraduates while increasing scientific knowledge, and using it not only to generate highly qualified papers but also to improve biodiversity conservation and sustainable use policies of the State of São Paulo (Joly et al. 2010). In 2007, BIOTA/FAPESP’s database, with >100000 records of 5463 species of higher plants, 149 of mammals, 168 of amphibians, 520 of birds, 74 of reptiles and 349 of fish, was used to generate a map of priority areas for biodiversity conservation and restoration that was endorsed by the State Secretaries of Environment and Agriculture (Rodrigues et al. 2008). Evolutionary modelling coupled with phylogeny allows uncovering evolutionary trends of differential mutation and diversification rates across varying taxonomic levels. The legume tribe Psoraleeae (Fabaceae) underwent a sizable diversification within North America circa 6.3 million years ago, illustrating a recent, rapid radiation. A phylogeny estimated from multiple genes (Fig. S5.1a) documented high mutation rates in the North American (NA) Psoraleeae, and showed that several genera originated in the Pleistocene, 1-2 million years ago. Figure S5.1. a. Chronogram based on total evidence across 8 DNA regions with average divergence dates for select nodes; b. Lineage through time plot (©2008 Egan and Crandall; licensee BioMed Central Ltd). Species diversity is heterogeneously distributed among genera in the subtribe. About 67% of the species belong to the most recently derived genus, Pediomelum (Fig. S5.1a), suggesting a diversification rate shift within the group. A 2.74-fold increase in diversification rate is suggested around 2.02 million years ago, followed by an 8.92-fold decrease 420000 years ago (Fig. S5.1b). Timing of the diversification rate increase supports the hypothesis that Quaternary climate oscillations brought on by Pleistocene glacial cycles influenced diversification of the group. Non-random spatial diversification also exists, with greater species richness in the American Southwest. Thus, the diversification rate shifts in NA Psoraleeae are not due to current climate regimes as represented by habitat, but instead, to past global climate change resulting from Pleistocene glacial cycles. NA Psoraleeae diversification is a good example of how earthly dynamics including global climate change and topography work together to shape biodiversity. In a time when the issue of global climate change pervades society and science, this study aptly illustrates the impact that global climate change can have over species evolutionary trajectories. Figure S7.1. Lianas in a tropical forest, ©LG Lohmann. Lianas (or woody vines) are an abundant and diverse life form throughout the world, especially in tropical regions. They are extremely important for forest regeneration, contribute with high percentages of species diversity and play key roles in ecosystem level functions (Schnitzer and Bongers 2002). Yet, this life form has evolved multiple times throughout the history of angiosperm evolution, with different liana groups varying significantly in their morphology and how they function. In particular, many liana groups present an unusual wood anatomy that may have allowed different liana groups to function in different ways (Fisher and Ewers 1992). Figure S7.2. Wood anatomy of lianas belonging to various families, ©LG Lohmann. This wood anatomy is very specialized and often includes unusual patterns of cambial activity. Even though such wood anatomy is present in a variety of liana groups, these morphologies evolved separately in different groups and vary considerably. The wide diversity of wood anatomical types in lianas probably led to significant differences in how they function and perform. Climate change and habitat destruction might affect different lianas groups in a variety of ways. Indeed, it is very likely that different lianas will respond differently to disturbance. Figure S8.1. Average beak size (PC1 is a combination of three beak size measures – length, depth, and width) for Darwin’s finches on Daphne Major Island, Galapagos, in each year of the data record (from Grant and Grant 2006). Picture of Geospiza fortis, ©A Hendry. Evolution traditionally has been considered a sedate process, partly as a legacy of Darwin’s opinion that “we see nothing of these slow changes in progress until the hand of time has marked the long lapse of ages.” (Darwin 1859, p84) Recently, however, it has been repeatedly demonstrated that many organisms can show rapid evolutionary responses to environmental change (Stockwell et al. 2003). A particularly clear example is beak size evolution in the medium ground finch (Geospiza fortis) of Galapágos in response to changing seed availability (Grant and Grant 2002). During a major drought in 1976, seeds became less abundant and the seeds that remained were larger and harder. Large-beaked birds were better able to crack these seeds and therefore survived at higher rates. Beak size was strongly heritable, and so the population evolved larger beaks in the next generation. Close monitoring of this population for 35 years shows several episodes of rapid evolution in different directions interspersed by periods of relative stasis. Rapid evolutionary change has also been documented in other contexts, such as when introduced organisms adapt to new environmental conditions and native organisms adapt to introduced organisms (Story 3.2), species adapt to climate change (Story 3.3), and populations respond to harvesting by humans (Story 2.8). Figure S9.1. Lonicera spp. ©D Schwarz. Species invasions can cause strong natural selection and rapid adaptation (Stories 3.1, 3.2, 3.6, 3.9 and 3.10), and adaptation can cause speciation. The intersection between these observations suggests that species invasions might cause rapid speciation, an expectation borne out by recent work on tephritid Rhagoletis fruit flies in North America. These flies have speciated within North America through adaptation to different native host plants, such as hawthorn (Crataegus spp. ), blueberry (Vaccinium spp. ), and snowberry (Symphoricarpos spp.). As with other phytophagous (plant-eating) insects, Rhagoletis fruit flies have also formed new “host races” on introduced plants. These host races can be considered separate species when they are substantially reproductively isolated from ancestral Rhagoletis found on other plant species. A classic example is that of the Rhagoletis host race that has evolved on introduced, domesticated apples (Malus pumila) within the last few hundred years. Figure S9.2. Evidence that the Rhagoletis fly on Lonicera has a hybrid origin between Rhagoletis flies on native plant species; blueberry (R. mendax) and snowberry (R. zephyria). The graphs show the probability based on genetic markers that individual flies (points) belong to the mendax or zephyria groups. Intermediate values for the Lonicera flies indicate that their genome is a combination of genes from the two separate species (Reprinted by permission from Macmillan Publishers Ltd: Nature (Schwarz et al. 2005), ©2005). Another example of how new insect host races (or species) can rapidly form on invasive plant species is provided by the recently documented Rhagoletis on brushy honeysuckle (Lonicera spp. ), a new species resulting from hybridization between introduced and native honeysuckle. Flies were first recorded on this species in 1997 and are believed to be the result of hybridization between Rhagoletis species originally found on the native blueberry and snowberry. The invasion of Lonicera into North America catalyzed the origin of the new Lonicera species in two ways. First, flies from the native species do not accept each other’s hosts but both accept Lonicera. This would bring individuals from the two native Rhagoletis species together during the mating period, thus causing hybridization. Second, adaptation to Lonicera then increased reproductive isolation of the Lonicera flies from both parental species. These examples show that invasive species not only cause new evolutionary trajectories for native species but can also cause the rapid origin of new native species. Figure S10.1. 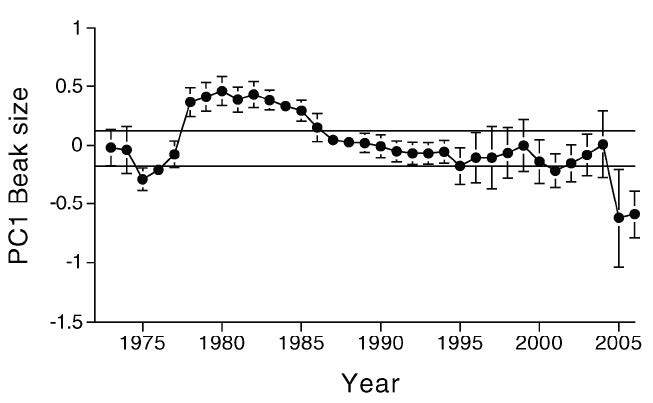 Cane toads that arrived most recently at a site (those at the invasion front) have the longest legs – and invasion speed has increased over the last 60 years (Adapted by permission from Macmillan Publishers Ltd: Nature (Phillips et al. 2006), ©2006). Figure S10.2. Bufo marinus, ©BL Phillips. When species are introduced to new environments, the evolutionary consequences can be dramatic. In some cases, adaptation by the introduced species to its new environment can speed the rate of invasion. In addition, native species might adapt to the new player in the local environment. The ability of an invader to spread and impact native species, and the ability of native species to repel or co-exist with the invader, are therefore both influenced by rapid evolution. Cane toads (Bufo marinus) were introduced to Australia in the 1930s and have since spread to occupy 1.2 million km2. During this time, the toads have evolved changes in several traits, and at least one of these (leg length) might be increasing its rate of spread through Australia (Phillips et al. 2006). Toads with longer legs disperse greater distances and the toads at the invasion front have longer legs. In addition, these invading toads have evolutionary impacts on native fauna, in part because they are highly toxic. Native black snakes (Pseudechis porphyriacus), for example, are sensitive to the toad toxin but have recently evolved reduced susceptibility. Evolution, it seems, is constantly shaping interactions between native and invasive species. Figure S12.1. A schematic drawing of a phylogenetic tree for cyclamen species (Adapted from ©2006 Yesson and Culham; licensee BioMed Central Ltd). Red branches are those threatened by climate change. Black branches show the relatively large PD represented by the set of species with lower values for probability of extinction due to climate change. The fact that species with lower probability of extinction are spread out phylogenetically means that a large amount of PD is expected to persist (left). In a hypothetical alternative scenario, the same number of species is threatened but black branches show that a relatively small PD is retained by the set of species with lower values for probability of extinction due to climate change (right). A challenge for research on climate change impacts will be to determine whether potential loss of PD, and so evolutionary potential, is large or small. Future studies for other taxonomic groups might similarly predict relatively low PD loss due to climate change. But they could also predict relatively high PD loss, resulting from impacts of climate change clumped on the tree and so implying loss of deeper branches. Phylogenetic diversity or PD (see Story 3.7) is a measure that takes account of phylogenetic relationships (and hence, evolutionary history) among taxa. It is arguably a more relevant currency of diversity, not only because it side-steps the problems in defining species, but also because it measures the loss of option values and evolutionary potential. Option values represent possible future benefits for future generations. Ultimately, it may be loss of option values and evolutionary potential (PD), not species loss per se, that is our greatest concern. A study by Yesson and Culham (2006) illustrates how the phylogenetic approach provides useful new information in assessing climate change impacts. They found that those cyclamen taxa with lowest probability of extinction due to potential climate change impacts were well-dispersed on the cyclamen phylogenetic tree. This pattern implied that the potential loss of PD and evolutionary potential due to climate change was smaller than might be expected based on simple species-counting: “while many individual species are at high risk, each major lineage is seen to contain at least one species with a reasonable chance of survival” (Yesson and Culham 2006). Fig. S12.1 illustrates alternative scenarios of PD loss. This study of climate change impacts on PD raises important questions for future studies: 1) is the most meaningful measure of biodiversity impacts estimates of loss of PD and evolutionary potential, rather than conventional species loss estimates? 2) will other studies similarly find relatively low PD loss, or will they find the opposite resulting from impacted (and/or persisting) species that are clumped on the phylogenetic trees? By combining data, techniques, and inferences from epidemiology and evolutionary biology, researchers have a powerful and novel approach to the study of a diversity of pathogens. Often, our first interest in the study of pathogenesis, especially with emerging infectious disease, is to identify the pathogen associated with a novel outbreak of disease. Success in defending the broader population against pathogen spread depends on our ability to rapidly identify both the source and the pathogen. Often this initial phase of diagnosis can be misleading. Figure S13.1. a. Evolutionary history of West Nile Virus demonstrating the phylogenetic position of WN New York 1999 clearly as a West Nile Virus and associated with an isolate from Israel and the Central African Republic (from Lanciotti et al. 1999). b. These phylogenetic results quickly led researchers (led by Dr. M Gale (right) and student B Keller (left)) to compare the genetics of an illness-causing Texas strain of the West Nile virus to a harmless African strain and discovered that the virus evades the body’s immune defences by blocking immune signalling by a protein receptor, a finding that could lead to a vaccine, ©UT Southwestern Medical Center, www.utsouthwestern.edu. A prime example of the troubles encountered (and time lost) when pathogens are misdiagnosed comes from the outbreak of the West Nile Virus in New York City. This virus was responsible for multiple deaths in New York, yet the Centers for Disease Control and Prevention (CDC) initially misdiagnosed the causative agent as St. Louis encephalitis due to their lack of an appropriate evolutionary comparison (Enserink 1999). Instead, they used the more traditional (and less sensitive) antibody identification approach. Only after the serological evidence was coupled with strong phylogenetic evidence was the etiological agent responsible for the "encephalitis" outbreak in New York correctly identified as the West Nile Virus (Lanciotti et al. 1999). Obviously, this delay in the proper identification has aided the spread of this disease that now covers much of the United States. Thus phylogenentic and molecular evolutionary approaches allow us to identify the pathogen of concern accurately, identify the origin(s) of the pathogen, and trace its spread. The study of origins, spread, and diversity of pathogens are clearly evolutionary questions. Population genetic tools can be effectively applied to infectious diseases to gain insights into the historical population dynamics of diseases, even over relatively short timeframes. One of the advantages of infectious disease studies is that historical samples can often be obtained, and this greatly facilitates the estimation of population dynamics. In a recent study of Neisseria gonorrhoeae – the etiological agent of gonorrhea estimated to infect 62 million people worldwide annually – the historical population dynamics were inferred from seven housekeeping genes distributed through the N. gonorrhoeae genome. The resulting inference of population size fluctuation through time (Fig. S14.1, black lines) has a remarkable correlation with the number of reported cases from epidemiological studies (red line) from a population studied in Baltimore, Maryland, USA (Pérez-Losada et al. 2007). Thus, these approaches have great utility in making inferences of past population dynamics of infectious diseases. Figure S14.1. Reported cases of Neisseria gonorrhoeae in Baltimore and genetic population size from 1970 to 2004. The red line shows the number of reported N. gonorrhoeae cases. Genetic population size was estimated from housekeeping genes (black lines), fluoroquinolone resistance genes (green lines) and porB gene (blue lines), with the solid line showing the mean estimate and the dashed lines the 95% highest posterior density (HPD) limits (Reprinted from from Pérez-Losada et al. ©2007 with permission from Elsevier). Phylogenies have debuted as admissible evidence in a court of law in the Louisiana, USA courts, as part of a second-degree attempted murder trial. A physician was hypothesized to have injected his former girlfriend with HIV type 1 (HIV-1) under the guise of a vitamin injection. Evolutionary theory provides clear phylogenetic hypotheses in both the transmission and non-transmission cases (Fig. S15.1c), which makes phylogenetic results crucial evidence in such cases. Figure S15.1. Alternative hypotheses based on a priori phylogenetic predictions if the HIV population from the victim was associated with the patients of the accused physician or not with the resulting conclusions. If the Patient (P) and Victim (V) sequences cluster together before any local controls (LC), then the conclusion is guilty, but if LC are between V and P, then the conclusion is not guilty (c, ©Crandall) and the resulting phylogeny from the actual data collected in the case showing the HIV isolated from the victim (Vx) was distinct from local controls (labelled LAxx) (a) and indeed associated with patients (Px) of the physician (b) (from Metzker et al. 2002, ©2002 National Academy of Sciences, USA). Phylogenies were estimated using nucleotide sequence data from the reverse transcriptase and envelope genes of HIV-1 isolated from the victim, patients of the physician, and local controls. The resulting phylogeny (Fig. S15.1a, b) clearly supported the hypothesis of transmission from the physician’s patients to the victim. This case represented the first use of phylogenetic evidence in a criminal court case in the United States. The physician was found guilty and sentenced to 50 years in prison.